Most supermarkets have a premium range of products but are they really worth paying more for? Looking for a pudding for a family meal I came across a Sainsbury Taste the Difference Apple Pie. This pie looked delightful with a lovely golden colour and wonderfully shaped pastry. However I had to think twice because at £4 this was almost twice as much as similar products. 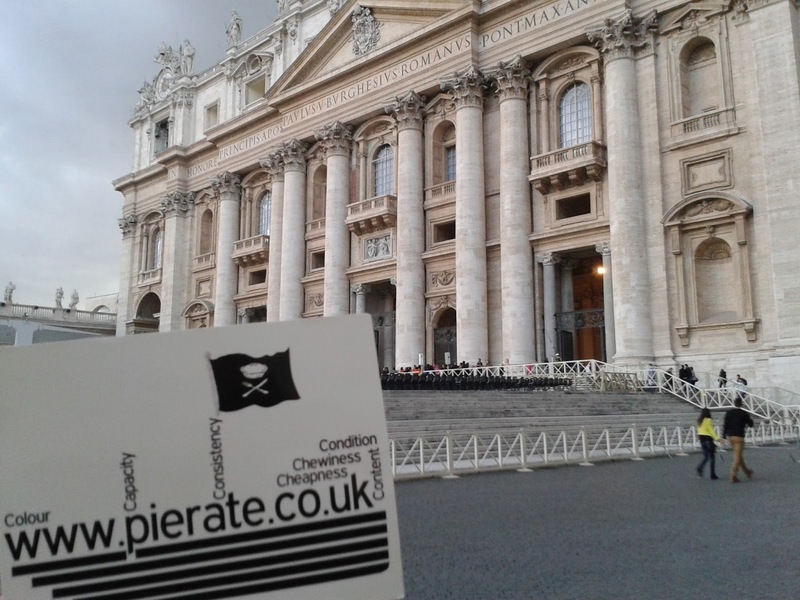 Cheapness is one of the seven Cs for a reason, the Pierateers are a frugal bunch. We aren’t just looking for the best pies, but the pies that we think are worth buying. So this pie had to do a lot to make up for the relatively high price. The first feather in the cap of this pie was the fact that it was actually quite big. Six people were comfortably served from this pie. This was a dual review from Pierateers SJL and ARL so came under even closer scrutiny than normal. Firstly the pastry…. this one was good for the dairy industry because it was lovely and buttery. Crunchy but not dry (despite being slightly over done on the edge), many try and achieve such a combination but few succeed. Next the content…. rough chunks of bramley apple delight. Other pies make up for a lack of apple taste by piling in the sugar but this pie left a sweet taste of a different kind. The sweet taste of knowing you have made the right pie purchase. You can get pies at half the price, but they’re not half as good. I often think these premium products are not worth buying but on this occasion I really can taste the difference. continue reading "A Different Taste with Sainsbury's?" If you aren’t already aware, I’d already searched the streets of Rome for a pie in the days prior to being in Milan. After all, I’m sure we’ve all heard of the phrase "When in Rome... do as the Romans do." But of course this phrase doesn't literally limit you to doing Romanesque things while visiting Rome. It's a wider phrase referencing that you should try to accommodate the culture you're in. However what about if you’re in Milan, not Rome? Sure, we know the Romans liked their pies, but do the people of Milan? 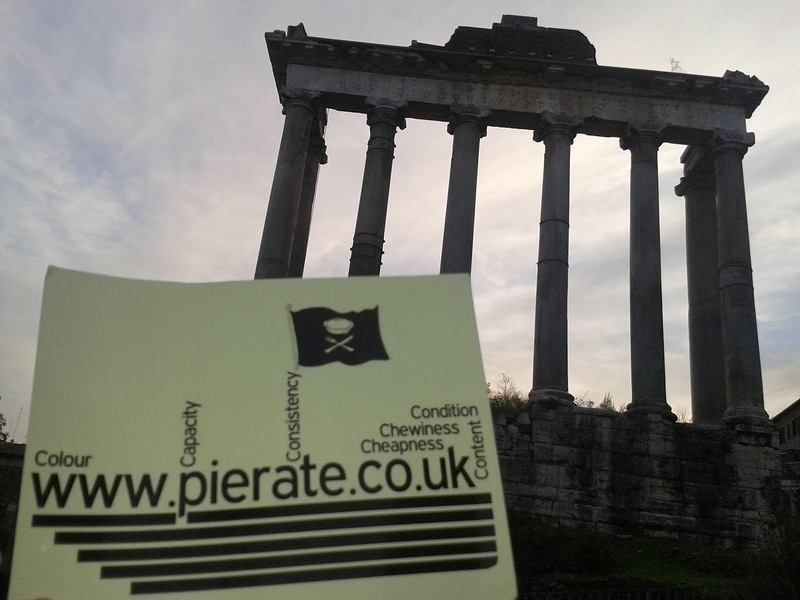 Well there was only one way to find out – a pie hunt in Milan! The pie was sold by weight and cost just over €3 (from €20 per kg) for what was not a massive, individual pie, but certainly larger than a typical Mr Kipling pie in the UK. It came covered in sugar, rather controversially hiding whether or not it was a tart or fully encased pie! 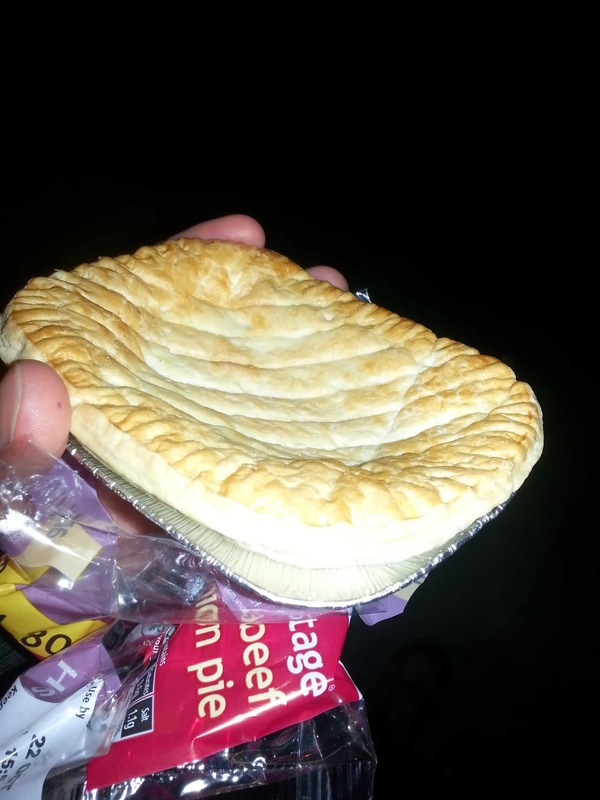 However fear not pie fans - the pastry product was fully encased in pastry and was therefore happily snapped up! I've already mentioned the pie was not that cheap at just over €3, however the capacity was very strong, full of bite-sized apple chunks. Also, regarding the content, there was a slight hint of lemon throughout the pie, which certainly made it unique compared to other apple pies I've eaten but I think ultimately there is a reason why lemon is not traditionally added! The colour of the pastry was slightly on the pale side, once you removed the sugar coating, but crumbled nicely upon biting and held the pie contents together well. 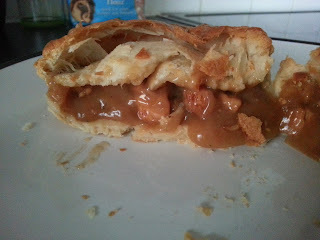 The pie wasn't chewy and was very consistent with apple filling throughout. However I'm unsure why this pie was presented with so much sugar on top, hiding the lid, as this rather spoilt the condition. Overall, I'm delighted to see a fully encased pie being sold in Milan but it didn't blow me away. 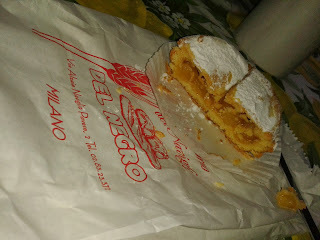 While the Milanese pie scores slightly higher than the Roma pie due to being a fully encased pie with proper fruit filling rather than just jam, taste and cost-wise I'd rather have a Crostatine from Rome again as it felt more unique to Italy. continue reading "When in Milan?! Apple Pie Review"
continue reading "Happy Thanksgiving 2013!" Unfortunately I was incorrectly served a steak and kidney pudding, rather than a steak and kidney pie, tonight during my visit to Nicholson's Pubs Bacchus Bar in Birmingham. To avoid my mistake and because their menu (in print and online) is currently wrong, please note the following in my open letter to the pub chain. I have included some of the feedback I received on twitter below (still awaiting my phone call) and aim to review the pudding and another pie I ate in a Nicholson's Pub in the coming weeks. I have raised this with you manager on shift at the time but wanted to put in writing that, while this is not a massive criticism of the quality of your food, I was genuinely disappointed to find that what I ordered on your menu and what I got provided did not match in a rather fundamental way. I run the web's leading pie reviewing website (www.pierate.co.uk) which is the number one hit when you Google "pie review" and was looking forward to rating the pie at your Bacchus Bar in Birmingham. However after getting over the initial disappointment of you having sold out of lamb and chicken pies by the time I ordered at 6pm, I certainly did not expect to be served a steak and kidney PUDDING when in fact I had ordered a steak and kidney PIE off your menu. 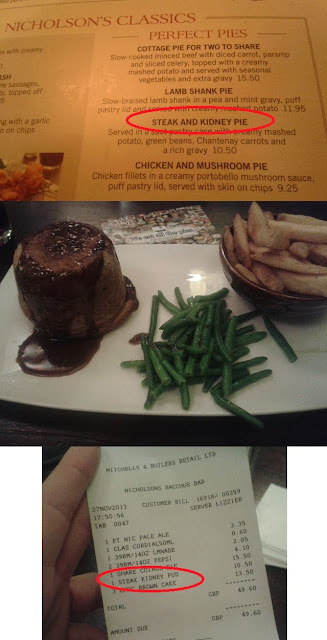 While the pudding tasted quite nice (I will give it a full critique when I review it on the blog in the next week or so), I'm afraid you've scored a rather big own goal here by having "pie" printed on your menu when "pudding" should be there. I realise 99.99% of your customers would probably not care which they had, but for me I was certainly looking for a pie. 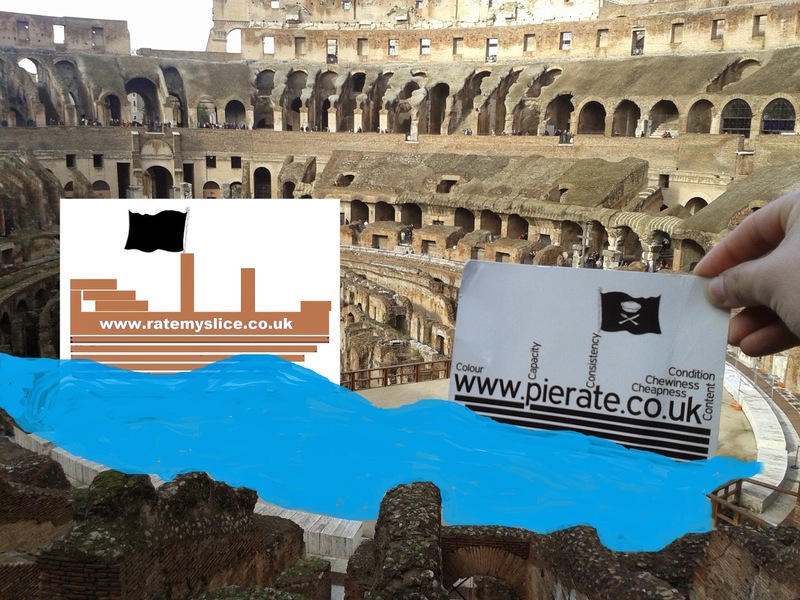 After all, I run www.pierate.co.uk and not "puddingrate" or any such thing. We have a readership of about 5,000 readers a month at present and they want to read our PIE reviews, not pudding reviews. I'm afraid I will have to disappoint our readership with this news when I write up my evenings account on the blog. 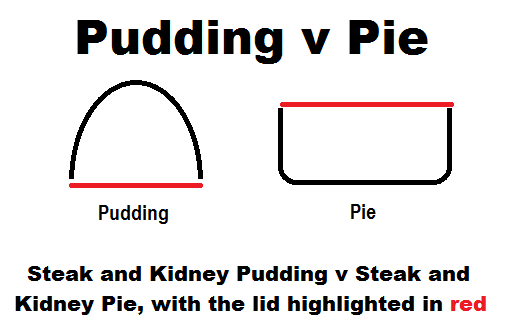 I am sure you will understand that while we want to promote pie selling establishments where we can, a pudding is not a pie and we report the honest truth. It appears this is an error in your printed menu (and the online menu to: http://www.nicholsonspubs.co.uk/bacchusbarbirmingham/food/) which I hope will be corrected shortly to avoid others making the same mistake I did. Happy for people to eat puddings if they prefer, but they should obviously NOT be labelled as a pie (and in my opinion, should not be under a header of "perfect pies" when they clearly are not pies). 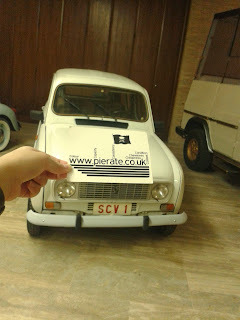 @pierateers Hi, thanks for the tweets. This was an oversight on our menu & we're looking at getting them reprinted in the New Year to fix. @pierateers Please allow up to 7 days from the date you submitted our feedback form. 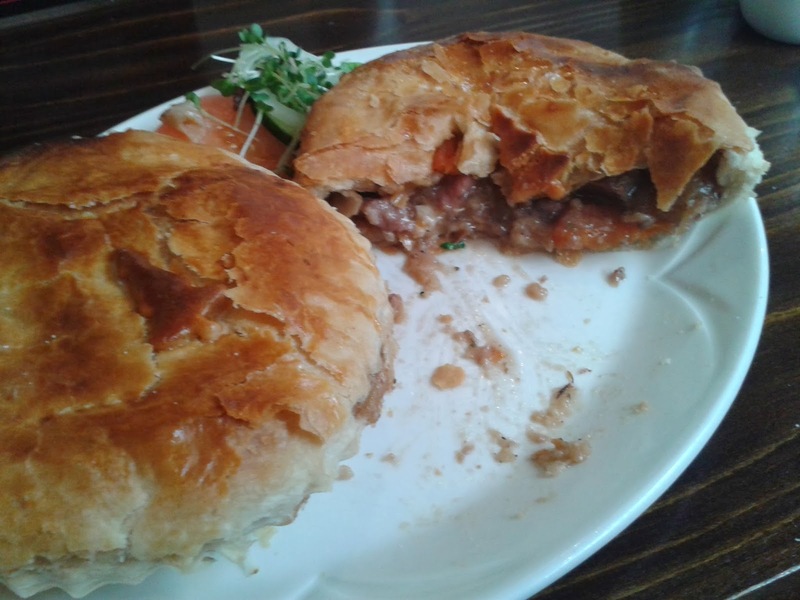 We have actually eaten a lot of genuine pies (not puddings) which can be seen in our Pierate Pie Rankings or you can click here for our steak and kidney PIE Reviews. 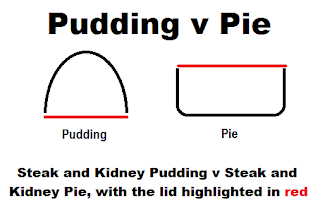 Where do you stand on the pie v pudding debate? continue reading "When is a pie not a pie? Open letter to Nicholson's Pubs"
When my great-Grandfather moved from Scotland to London he was so poor that he had to go to school without any shoes on. It seems quite likely that at some point in his life he would have eaten a Scotch pie. In those days Scotch pies were made with cheap mutton. It was minced so that the fatty meat was easier to eat and spiced to make it more palatable. I like to think that both my family and Scotch pies have come a long way. As I made the trip back to Scotland I felt slightly extravagant in the fact that I actually took two pairs of shoes for my trip of less than a week. 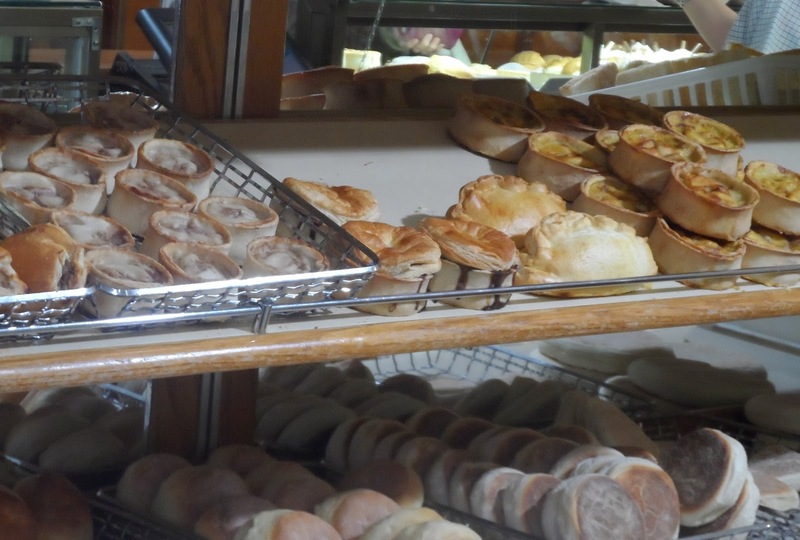 While they are still generally cheap, the best Scotch Pies are now highly regarded with bakers fighting it out each year for the title of 'World Champion' at the Scotch Pie Awards. The World Champion in 2013 was JB Christie of Airdrie. This award has done much for their reputation and the owner, Andrew Chisholm, recently appeared in an episode of Pies & Puds, showing Paul Hollywood how they make their World Champion Scotch Pies. After attending the Scotch Pie Awards I decided to make a pie pilgrimage to Airdrie in order to sample these pies which come so highly regarded. It was a gloomy day when I arrived in Airdrie but once I found JB Christie the atmosphere inside was anything but gloomy. This small bakery was packed with both people and products. 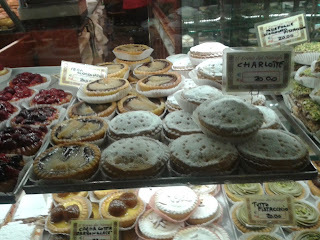 There was a bright array of cakes, bread, pastries and of course a selection of pies. There were other tempting products but I had my eyes firmly on the World Champion Scotch Pie. I couldn't wait so I ate the pie as soon as I was out the door. It had a classic Scotch pie appearance with a golden brown colour. From the first bite I could tell this was the best Scotch pie I had ever tasted. What set it apart for me was the perfect variation in texture. The contrast between the crunch of the pastry and softness of the filling was superb. 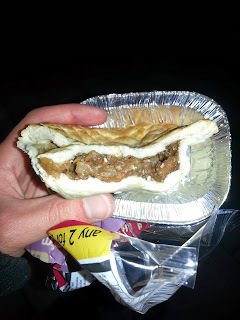 This was certainly more spicy than most Scotch pies I have had but the balance of flavour was just right. The flavour of the beef still held its own and ensured a satisfying meaty taste. The filling was soft but still retained some bite unlike others which can be too mushy. Having had such a great pie I then felt I had to pay my complements to the chef. I walked the short distance to the nearby JB Christie office and Andrew Chisholm was kind enough to come out and talk to me. When he offered to show me around the pie production facility I felt a surge of excitement. I have been reviewing pies for some years now but this was a first for me. Despite doing things on a relatively small scale Christie still manage to produce 120 dozen pies a day. It is quite a labour intensive process and all the pies are finished by hand. In the past they used a depositor to fill the pastry shells but Andrew told me they actually stopped using that as a change in meat could clog the machine. Andrew said he sees the benefits of doing it by hand. The pastry is shaped by a machine called a waddle. Andrew assures me these are reliable bits of kit. The specification for them hasn't changed in about 70 years. The business that made them produced something too good. The machines didn't need replacing so the company went out of business. The waddle turns a pastry lump into that characteristic pastry shell we expect a Scotch pie to have. Fresh off the machine the pastry shell is soft, Andrew says there is no way that the shell could be filled with the moist filling straight away. This is where I learnt a secret about the Scotch pie which I hadn't expected. They place the pastry shells on racks and allow them to dry (or 'cure') for up to three days. This gives the pastry much more hardness. It develops the crunch of the pastry but, importantly, also allows the shells to be filled with quite a wet meat. JB Christie have racks and racks of pie shells which Andrew shows me are of varying degrees of hardness. This is where other manufacturers perhaps miss out if they don't have the same amount of space to store the shells for long enough. Andrew said this is where Paul Hollywood went wrong with the version he tried to make. Due to the soft pastry he had to use a ridged filling consistency, more like a pork pie. Andrew then takes me to see the finished pie, cutting the pie to demonstrate that it still has softness to it but the outside of pastry maintains a crunch even when reheated. Despite the fact that traditionally Scotch Pies were made with mutton Andrew believes in the beef versions that are by far the most common now. He said that to use mutton they would find it hard to get the seasoning right. He says he hasn't changed the seasoning for their Scotch pie since he took over the business. I was surprised to learn he only took over 18 months ago, not long before their Scotch pie awards success. While I was still there I took the opportunity to ask Andrew a few more questions. Firstly I had to know what his favourite pie was. "That would be a Scotch Pie. We don't do macaroni, we don't do chicken, we find the majority of people like a Scotch pie and we concentrate on that." I then asked how he rated his chances for the 2014 Scotch Pie Awards. "The pies we put in I was quite happy with. It is actually very, very hard work to keep things where you were. Supplier change their spec, a different harvest... the raw material is natural, the meat changes." I didn't appreciate before speaking to Andrew that to maintain a top product you have to keep running just to stand still. You can't take for granted that your product will continue to be good even if you try and keep everything the same. So what sort of score would I give to the JB Christie World Champion Scotch Pie? 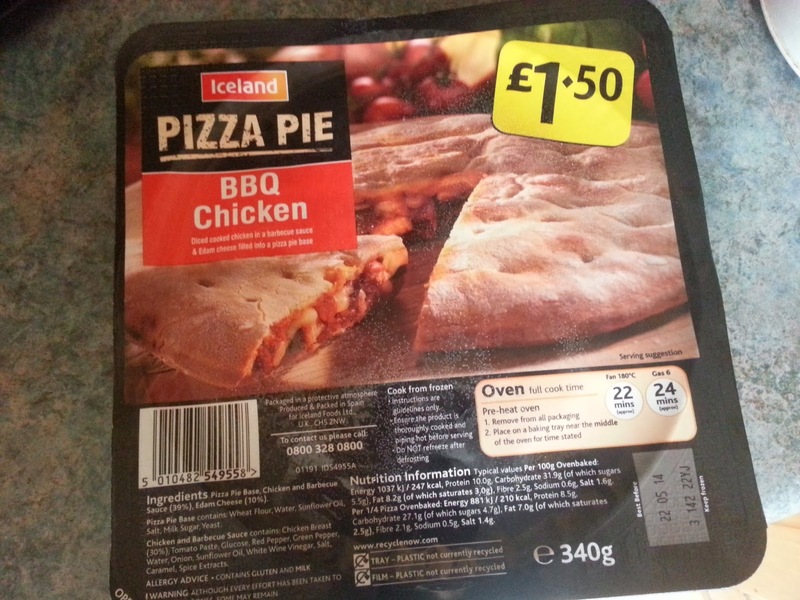 Well when the price is just 55p for the small and 77p for the large version (plus a wee bit more to have it hot) I think this is one of the best value pies I have ever eaten. As Andrew said to me this is not a gourmet pie, it is a working man's product. However, it does taste as good as many gourmet pie I have eaten so I am forced to give it a very high score. This is what pies are all about; good, honest and simple. 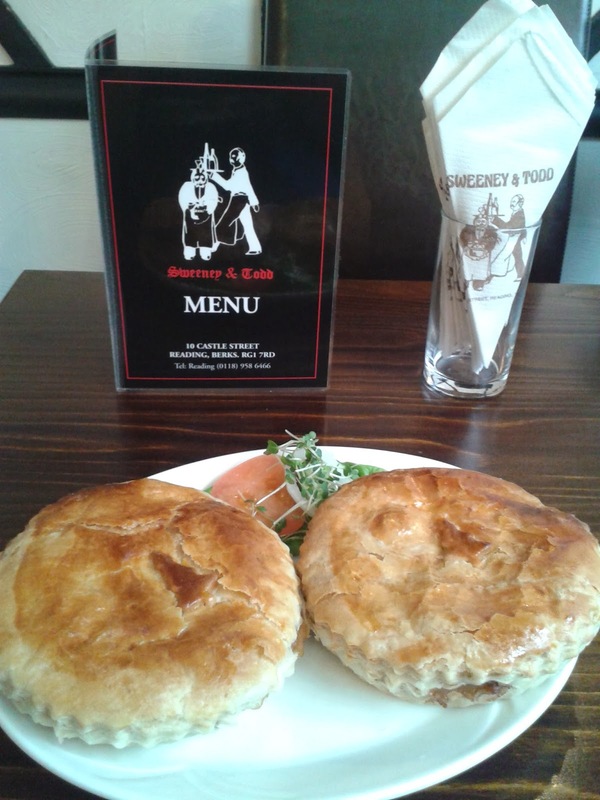 It goes straight to the top of our best Scotch Pies list. Many thanks to Andrew Chisholm for giving me so much time in his working day. This really was an eye opening experience and has allowed us to finally understand what a Scotch pie actually is. continue reading "World Scotch Pie Champion 2013"
I expect many of you have heard the expression "When in Rome" but perhaps not all of you know the full phrase: "When in Rome... do as the Romans do." Of course this phrase doesn't literally limit you to doing Romanesque things while visiting Rome. It's a wider phrase referencing that you should try to accommodate the culture you're in. So in Britain, it would call on you to do as the British do and eat meat pie! However what about if you ARE in Rome? In fact, what did the Romans actually do?! Well, quite a few things actually, thanks for asking! The Romans are widely regarded as devising road systems (for linking conquered towns), postal services, wayside inns, sewers and loos, amongst other things. After a nice, pastry filled breakfast (sadly missing a pie though) we had an early start to day two, as we wanted to ensure maximum time in the Vatican Museums because we thought it closed at 1pm. Turns out it didn't close that early... but that's fine, because it gave me extra time to hunt the various cafes on site for pie. 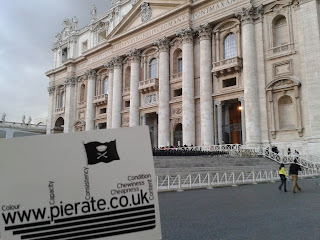 Sadly it seems that pie was not pope-ular, as I couldn't find one anywhere. However I did have time to see what a Popemobile might look like if the pope was a pie fan. On the way back into Rome that night we happened to pass a patisserie shop called Zucchero e Farina, which I thought rude not to check out. Turns out it was a master stroke, as there before me lay the pastry beauties I was here to try. Now before we get totally carried away here, I hasten to add that these were only lattice topped pies. But let's face it, beggars can't be choosers and I certainly wasn't going to wait! These lattice topped pies were called Crostatine and were €1,70 each. The pie would be saved to eat the following day but were eventually rated as 4/7. 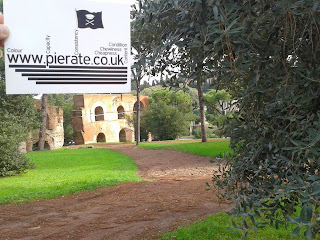 With the sun back out and a Palatine Hill to conquer, we set off for a day out amongst the ruins of the Roman Forum. For those who don't know, this would have been a place of hustle and bustle which no doubt many a Roman pie seller would have frequented in the porticos (roofed walkways held up by columns) of the area. Sadly there were none out selling pies during my visit. Fortunately though I had a pie in the bag (quite literally!) 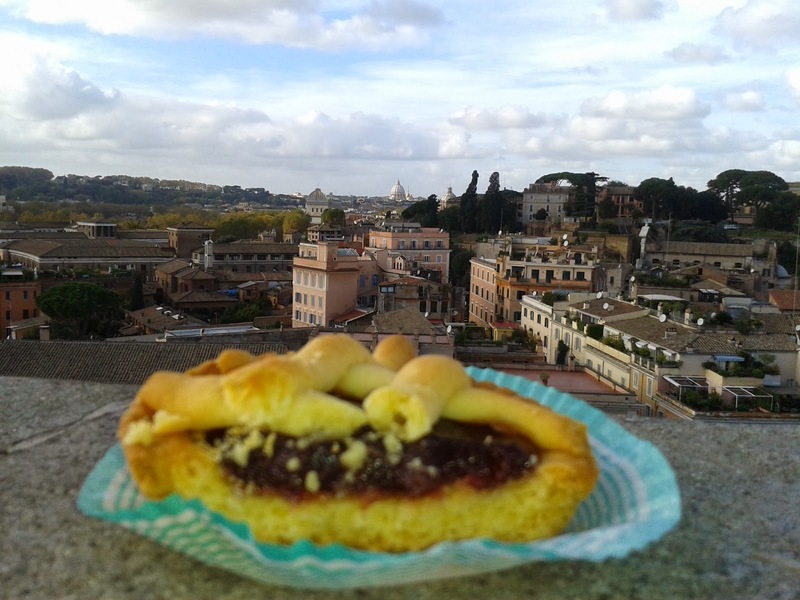 so I enjoyed wandering around the ruins of the Palatine Hill with pie in hand. You can read the pie review here. After a very late pizza lunch, we decided it was too late to enter the Colosseum but would instead do that the day after. The late afternoon and early evening was instead spent in the oldest museum in the world - the Capitoline Museum. Dinner followed in the Trastevere region, where I had lamb chops and some of the best roast potatoes I've ever eaten! Sadly no meat pie though! 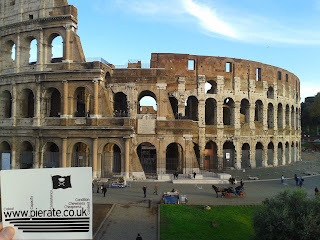 We thought we might as well go to the Colosseum (well... when in Rome and all that!) so that kicked off day 4. While we had seen it in the dark on the first evening, it was far more spectacular when inside! Sure, it would have been nicer if a quarter of it hadn't been hidden behind scaffolding, however it was still a marvellous sight to behold! Of course, you don't need me to tell you that the Pierate Ship won this particular battle! Also, interestingly we found out citizens of Rome would sometimes take in cooking stoves and food to eat while they watched! Wonder if many pies were consumed amongst the 60-70,000 strong crowd?! More pizza for lunch followed before a trip to the Pantheon, Trevi fountain (in daylight) and Spanish Steps. Once again I had a lovely meat dish but sadly no pastry encasement to improve the meal! After an early breakfast to make the most of our morning, we took a short metro trip down to the Museo della Civilta Romana, which is a very interesting museum out of the city centre featuring many scale models of various buildings and items related to Rome and the Romans. Well worth a visit, especially to see the huge 1:250 scale model of the city of Rome, built in the 1930s based on maps made at the time of Constantine around 313 AD. And with us departing to Milan on the train, there ends our 'When in Rome' pie hunt! Success! - though not the highest scoring pie. I would certainly have another one though, if I ever wanted to 'do what the Romans do' again. Next stop Milan! Italian Pies were also found in Milan and Bergamo. These reviews will follow in the coming couple of weeks. 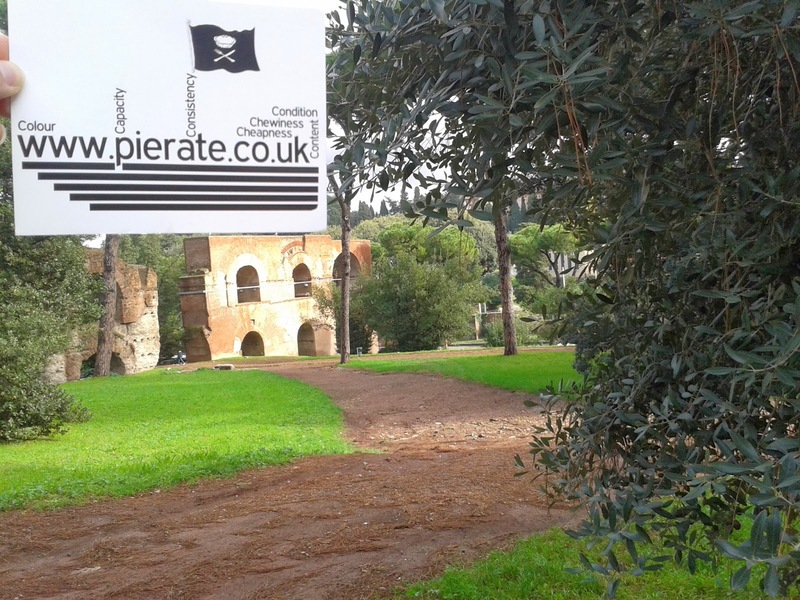 continue reading "When In Rome..."
I’m not officially a Pierateer but I do hop aboard as Ship’s Cook from time to time, so I’m setting sail on a quest to get people making their own pies at home. I’ve made it my mission to bake (and eat) pies, testing out recipes so you don’t have to. I won't be giving points to the pies I make, but I will be talking about the Seven C's so you can decide which recipes are the ones for you. My very first pie recipe is one that I made for a recent gathering which included some of the Pierateers and a few extra crew members who had been drafted in. You can probably see why I couldn’t resist trying this one! And don’t worry, it still meets the criteria for being a pie as the middle section is fully encased in pastry top, sides and base. I’ve never made pastry with wine before, and the closest comparison I can think of is that it’s a lot like pizza dough but without the need for proving. If you’re used to shortcrust pastry (or any other type made with a base of butter and flour) this will taste different, but it goes very well with the filling and the doughy consistency is necessary for the slightly more difficult step – shaping the pie. I was a bit concerned that my pie was going to end up looking like a squashed octopus, but I’m glad to say that it didn’t! Both the pastry and the filling are very durable, so the cutting and folding was pretty simple. By leaning the ‘rays’ against each other the whole thing was made extra stable ready to go in the oven. Definitely follow the instructions and build the pie on the baking tray – the finished article is quite big and it would be difficult to transfer it after it’s made! The pastry in this recipe can take a while to turn a dark golden colour, but that’s easily fixed by leaving it in the oven for a bit longer. I was a concerned about burning the exposed filling on the edges but that didn’t turn out to be a problem, it just meant that the edges were lovely and crispy. There’s no gravy in this pie as that would cause some serious structural problems. However, I thought the filling had a nice smooth consistency thanks to the ricotta and egg, and as spinach is fairly watery anyway it isn’t too dry or stodgy. What can I say? In this recipe you mould the pastry around the filling, so this this scores very highly for capacity (especially if you eat the middle section). There’s no meat in this pie so you don’t have to worry about chewiness. The filling is lovely – soft, smooth and with a little bit of texture from the spinach. Yum. 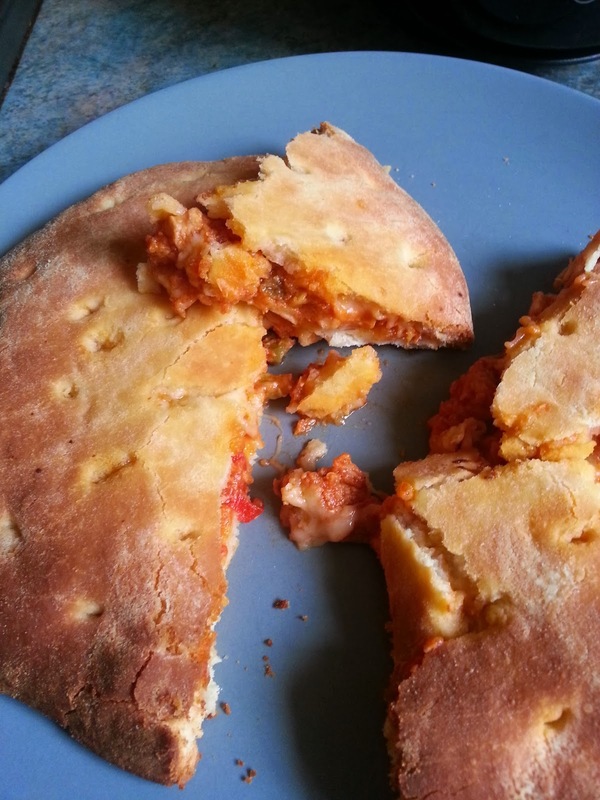 For people who do a lot of baking and already have salt, flour, oil, eggs and probably wine in their kitchen, this is a very cheap recipe as I only spent £3.20 on the filling. It also gives you a way to use up stale bread as breadcrumbs. Even if you do have to buy all the ingredients you could feed six – eight people a decent portion of this pie with some mash and vegetables, so overall it’s very good value for money. Spinach and ricotta might not be the most original choice for a vegetarian option, but it’s a classic for a reason - it looks good and tastes good. I think it would also work with other soft cheeses such as goats’ cheese or mascarpone, so there are lots of options if you want to experiment. Condition: Not the most traditional of pies, but this is the one to make if you want to impress people. The shape is unusual and very pretty, and having some filling on show is a nice touch. It’s also easy to transport – mine went on a two hour car journey (wrapped in tinfoil on a baking tray) and arrived with no damage. 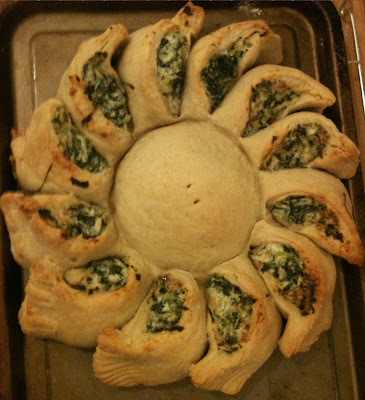 continue reading "Reci-pie Review: Spinach Sun Pie"
Please Note: This pie review forms part of the wider "When In Rome..." pie hunt. 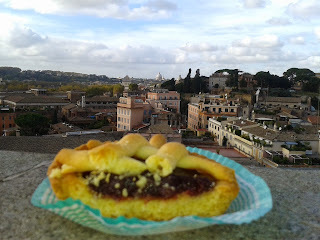 The local term for them was Crostatine, which were pastry base and sides, filled with jam (in my case, strawberry) and then a pastry lattice on top. The depth wasn't huge, it has to be said, but you could tell the base and the sides apart (unlike you could with a slice). 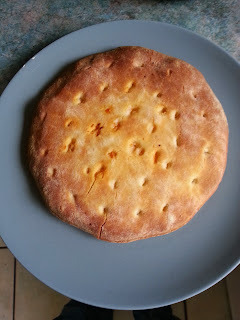 What rescued it from just being a tart (another rival to pie in the culinary world and quite popular in Rome) was the pastry lattice lid, keeping at least some of the content under wraps. VatiCAN you see the famous landmark in the background?! The consistency was okay, with the thick, drier pastry and the soft, moist strawberry jam holding together nicely as I bit into the pie. The content tasted fine but with it just consisting of strawberry jam it certainly didn't give me a taste sensation. I'd have preferred they did something a bit more exciting with it than just strawberry jam! At €1,70 this wasn't particularly cheap either for an individual pie but the shop was selling in central Rome. The condition of the pie was quite good and sold in a nice paper case, but as previously stated I couldn't fully assess the capacity as sadly wasn't fully encased. The pie certainly wasn't filled very deeply with jam though, so the score is minimal. The pie (and certainly the jam filling) wasn't chewy and the colour was good. 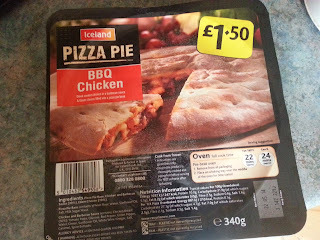 continue reading "When In Rome... Pie Review"
When it comes to supermarket pie selections, ASDA seems to have really upped its game. Here is another offering from ASDA, this time in the form of a Seriously Tasty Pies Roast Chicken pie. At just £1.00, this is a total bargain! Or is it? Taking this "big fill" "heat and eat" pie out of the oven, it's taken on a nice golden colour, and the puff pastry is glistening quite nicely. The pastry does look a little light and thin though, but the condition of the pie is good. In this cross-sectional view, you can see the thin-ness of the pastry - I'd prefer it to be a bit thicker. The pie isn't completely filled to capacity - I wouldn't call it "big fill" - but the air:filling ratio is still satisfactory. The chicken is not at all chewy, but it's the consistency and taste of the gravy that is the main selling point of this pie for me. It is smooth, tasty and the perfect thickness. The content is certainly tasty and the roast chicken flavour very unique and not something I'd tried before. Overall, this pie was very cheap, and very tasty. 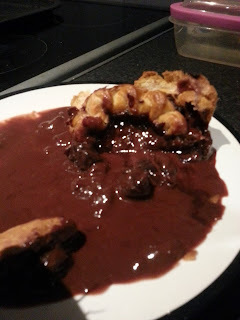 However, the pastry was a bit thin, and although the gravy was nice, it didn't have that authentic "home-made" feel. The chunks of chicken were also quite small. I would definitely buy this pie again though, because the cheapness more than made up for this pie's faults. continue reading "Are Seriously Tasty Pies seriously tasty pies?" We're really entering bargain pie territory now. 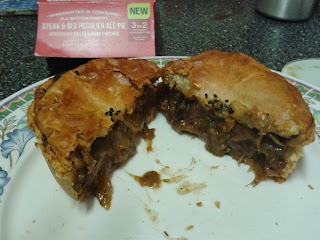 I picked up two of these Heritage beef and onion pies from a local Nisa store for £1.80 for the pair. I understand that Heritage is essentially the Nisa own-brand. Does the 90p per pie really translate in a bargain, though? I must note that I ate this pie cold, straight out the packet. I'm not sure if you're meant to be able to do that, but either way I'm declaring it now that I didn't follow any of the cooking instructions on the packet. If you're not meant to eat it cold at all then I apologise for this, but I'm not convinced it would have affected the final score anyway. Condition-wise, as you can see, there is quite a concavity to the lid of this pie. The lid has sunk quite deeply into the middle of the pie, not giving me huge hopes for the structural integrity of the remainder of the pie. The pastry is dry, flimsy and feels of rather poor quality. The colour of the pie is quite pale - perhaps this would darken on cooking though. The filling is very basic - a slightly chewy mush of beef and onion. It tastes fine but nothing special. 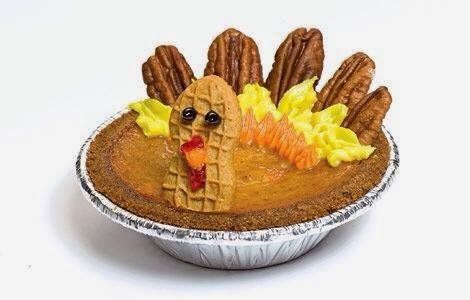 I'm trying to imagine really enjoying this pie in any shape or form. It would certainly be out of place on a plate covered in gravy with chips. Overall, this is a rather bland affair in my opinion. I'd say it was a "basic" pie, but I'd hope no-one considers this to be the basic standard of a pie. The basic standard of a pie should be higher than this very cheap and uninspiring example. continue reading "Pie eating is in my Heritage"
continue reading "Packet in! 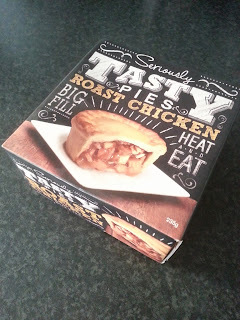 Mislabelling confuses pie lovers"
The Simple Simon's pie box arrived with four new pies to review. The first was eaten by Pierateers RAS and TJP for pudding, and was a Sinful Simon's Devilishly Delicious Chocolate and Black Cherry pie. It was nice to have a chocolate-filled pie for once. The chocolate was a very nice consistency, and complemented the cherry well. However, the richness of the pie and the inclusion of chilli peppers led to quite a sting in the throat, meaning I had to reach for the water quite a bit. The pastry was good with a nice thickness, although a little chewy in parts. 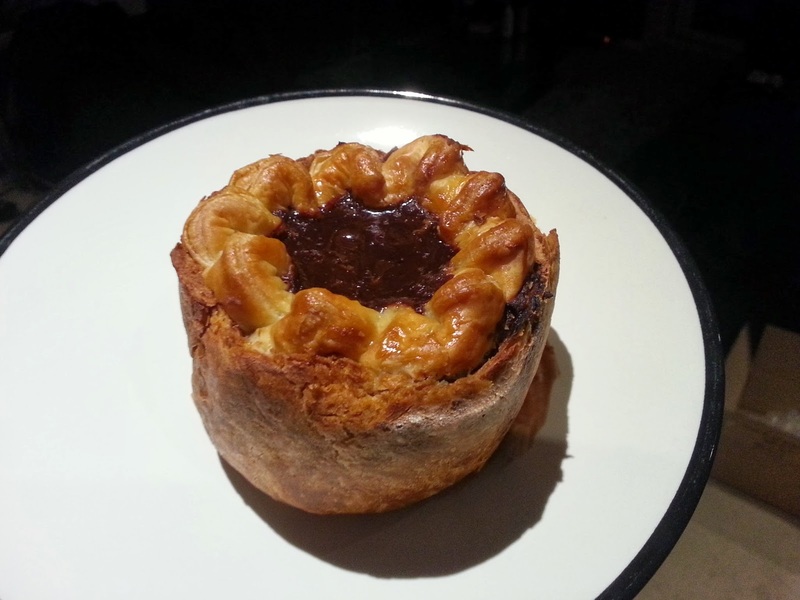 However, the pastry was certainly very tasty and worked well the the chocolate. The chocolate was runnier than I was expecting, but the pastry could mop this up. At a little over £4, this pie is a little on the pricey side. In summary, a novel chocolate pie but just a bit too spicy in terms of content. We would certainly try another chocolate pie like this again. continue reading "Chock full of chocolate! A fiery Simple Simon's pie for dessert"
Ding dong merrily on pie! 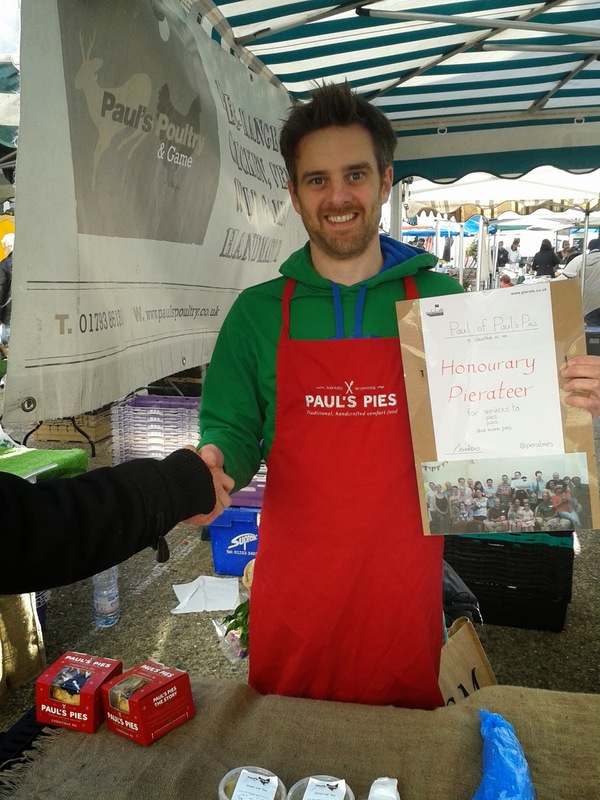 The Pierateers had the great pleasure of once again visiting the Notting Hill London Farmers Market, the site of the purchase of the #1 top rated pie on Pierate. 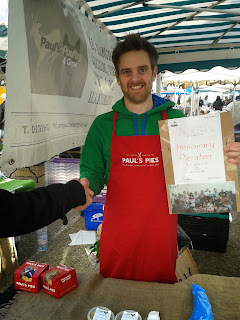 This time, however, the Pierateers were in a festive spirit and keen to try out Paul's new Christmas pie. Paul's Pies' Christmas pie takes inspiration from the best parts of Christmas (the food), and mixes this with a secret family recipe to create a wonderful Christmas treat wrapped up in pastry. Well, not completely wrapped in pastry, as this pie signifies a controversial departure from the usual totally-and-wholly-wrapped-in-pastry-pie that we so love at Pierate. The pie is topped not with pastry but with cranberry. First things first, this is a cold eating pie. 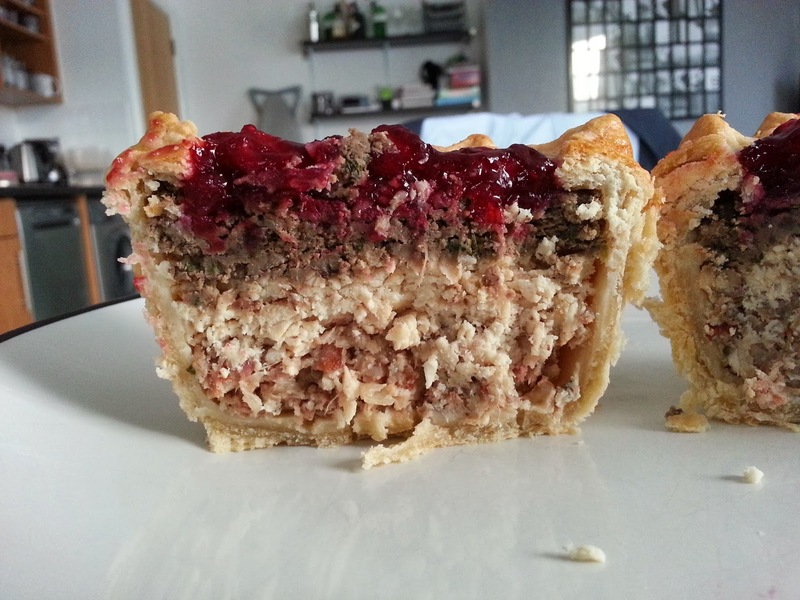 Secondly, this is a sharing pie - which makes sense, as Christmas brings us together in the spirit of sharing. Thirdly, this pie will retail at £4.99 - more expensive than a normal Paul's Pie of this size, so is the extra expense worth it? Let's find out, and crack open the Paul's Pies Christmas Pie. 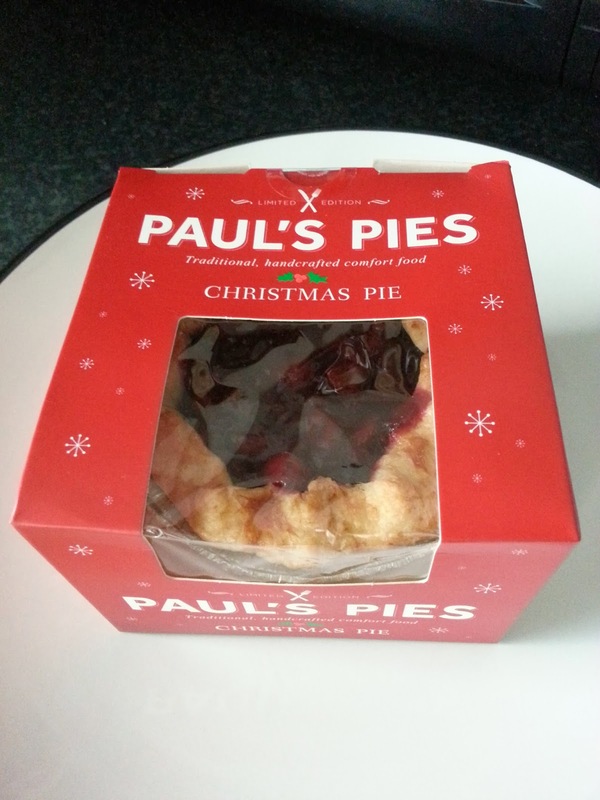 The Turkey Pie from Paul's Pies - and Paul himself - feature in our '12 Pies of Christmas' video! 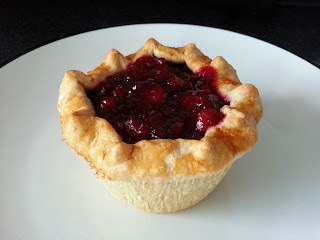 Here is the pie with its cranberry topping. Yep, there's no pastry beneath there folks. That will surely affect the judges scores. Regardless of this, the pie is very attractive and has arrived in great condition. Remember, there's no cooking involved here! This is an instant-eat pie! 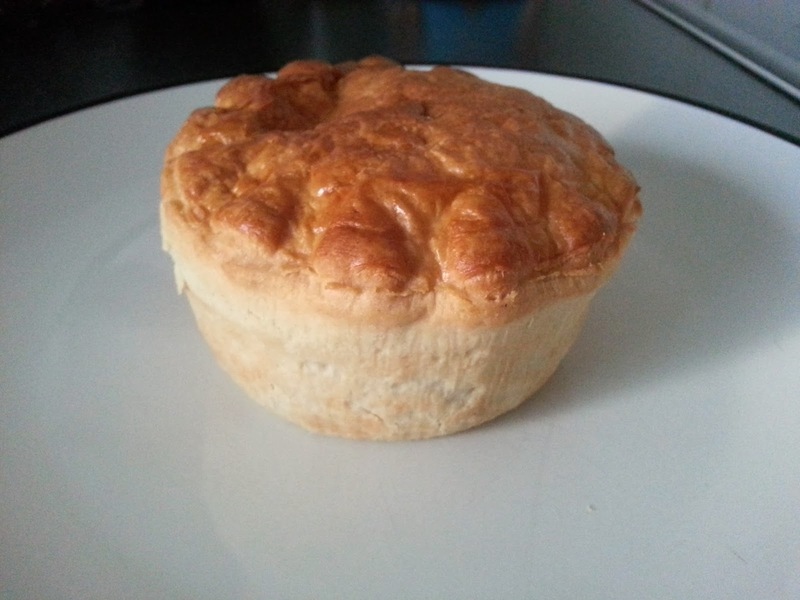 Great idea having a cold Christmas Pie (similar in nature to a pork pie but not at all fatty like some lower quality pork pies are) - though wasn't originally expecting it to be a pie you would eat cold. The pie held together well. The layers worked, though not quite to the ratios I'd prefer. Too much cranberry for my pallet and a little too much stuffing and not enough turkey for me. It was surprising to see pork as the main ingredient at 23%, compared to 18% turkey. The pie certainly reflects a nice Turkey Roast but I think if I had more pork than turkey eating my Christmas Roast, I'd feel robbed of turkey then, so I have to apply the same standard to a Turkey pie. Of course we at Pierate have high standards when it comes to pastry encasement, so while the layering with cranberries on top as the "lid" look nice, they unfortunately do not replicate a true fully encased pie. This is a shame and it must be pointed out that the other meat Paul's Pies don't suffer from this lack of full pastry encasement. Ultimately a unique and very good non top-crust Christmas Pie and certainly one that would light up anyone's Christmas! This Christmas pie is extremely attractive, with a clever cranberry "lid" and charming pastry crimping. Cutting open the pie, it is clear how dense it is and why it is a sharing pie (although I did eat the whole pie myself, a Pierateer rarely shares!). I see that Pierateer RAS has commented that there was too much cranberry (please be aware that when we do joint reviews, we write our reviews and scores independently with no conferring), but I felt that actually there wasn't quite enough! Because the pie was so packed with meat, it became a little dry to eat, and the cranberry really helped to moisten things up. The layering within the pie is absolutely fantastic and a joy to behold. The turkey was perhaps a bit crumbly, but the pie was formed well and the layering stayed intact. Of course, at £4.99, this is pretty pricey for what's not a big pie. However, the pie was absolutely packed to capacity with copious amounts of filling, and I was certainly very full after eating the whole thing! This is a sharing pie, and with it being so deep and crisp and even, it would be a delight to have in the centre of any dinner table this Christmas. continue reading "Paul's Christmas Pie is deep and crisp and even"
continue reading "Paul adds Honoury Pierateer to list of awards"
continue reading "Sweeney and Todd Christmas Pie"
Of course you will all recall that the first of these pies formed the first ever episode of ‘Pie Factor’ a few weeks ago. Through to the next round with a very reasonable 5.4/7 was the Gastro Pub Beef And Ale Pie. However the Gastro Pub Aberdeen Angus Steak Yorkshire Pudding Pie sadly was not actually a pie – and was rather embarrassingly escorted from the studio by security. I'm the Steak and Old Peculier Ale Pie from Marks and Spencer. I’m one of the 3 for 2 individual sized Yorkshire Pies that you can buy, handcrafted in Yorkshire and ready for you to enjoy for your tea. No, definitely for your tea. I’m from Yorkshire, you see. So we call tea... well... tea. But what if you want a cup of tea? Do you not get confused? You mean a cup of cha? No, I don’t want you to cha cha cha! This isn’t Strictly you know! It’s the Pie Factor. Right, anyway, what will you be filling your performance with tonight? Well the steaks are high this week, or perhaps I should say big. Big, meaty pies of steak to be precise. However before you can get to these big steaky chunks you’ve got to get through the onion layer. That's right... we’ve packed quite a lot into this little fully encased in pastry pie – including plenty of onion! Right... okay. Well I’m glad to hear you’re fully encased in pastry, but...well... I have to say I’m a bit disappointed by the onion layer. I mean, as soon as I started to dissect your performance it was just oozing with onion. Had to wait to get to the steak. If you’re going to give me lots of onion, I want it in moderation. Steak first, onion if necessary. Point taken. There was rather a lot of onion to be fair. Not sure why. It was a shame really. I’d expect it from one of the – how do I put this – less affluent contenders. But Marks and Spencer... you don’t normally associate them with “padding out the pies”! I know, I know. But the steak – that was good right? And the pastry? The steak was very good and tender – I can’t deny that! And the Old Peculier Ale can’t be ignored. 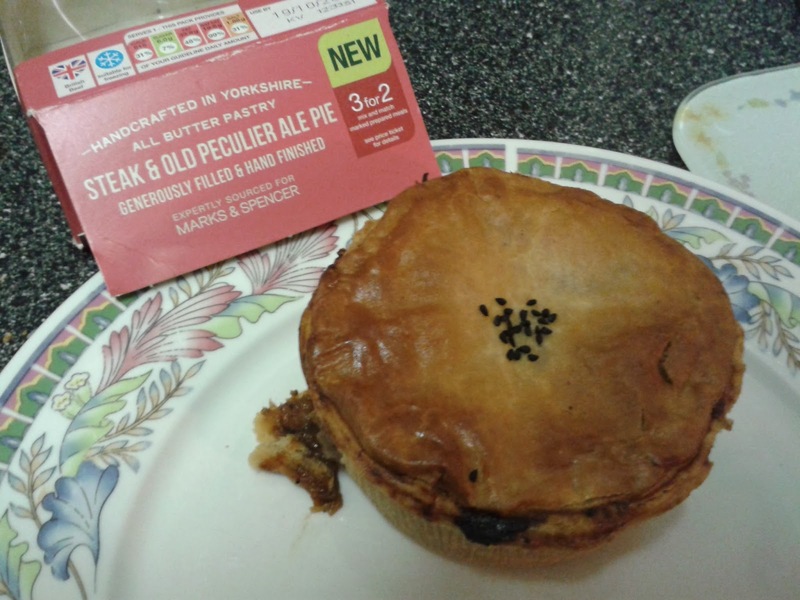 It certainly tasted different to other steak and ale pies I’ve had before, which was nice to see. I’d say the flavour of the gravy was good, though a little too peppery in flavour for my taste buds. The pastry though was very nice – particularly the pastry lid. Not too thick and held together well. It’s fortunate we fully encased the performance in pastry then this time! It sure is! 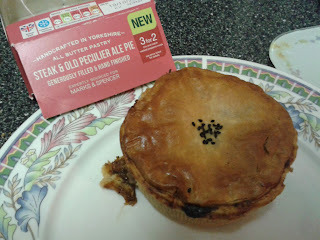 While the excess onion was a downer and the pie was a little small for an individual dinner (or tea) portion, I would say it was the best Marks and Spencer’s Pie of the ‘Pie Factor’ so well done! continue reading "Have Marks and Spencer got the Pie Factor?! Take Two"